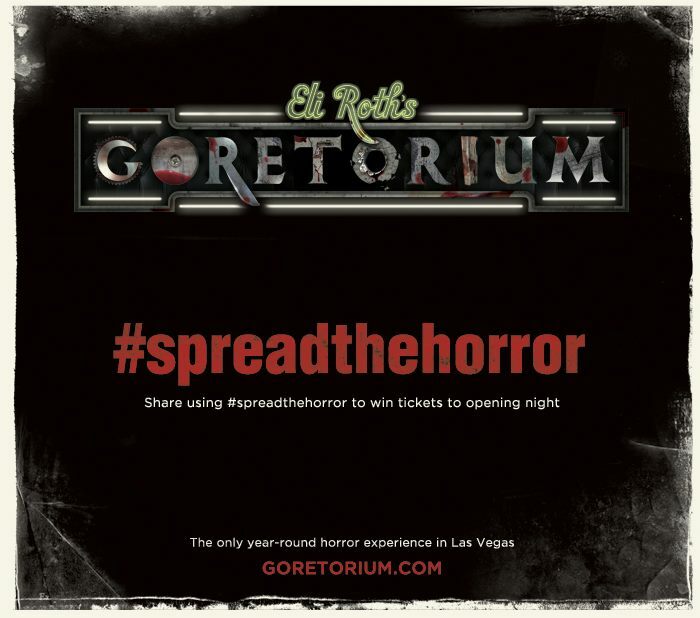 Eli Roth’s Goretorium is opening on September 28th, and it hopes to change the way you see haunted houses. It’s going to be a year round all out assault on your senses as you navigate yourself through the old Delmont hotel located at the very edge of the Las Vegas strip. Gore, actors and special effects will fill you with dread as you try to get yourself out of the infamous hotel that authorities believe is connected to a string of disappearances and grisly murders. Now you can win your way into the madness, and realize that once you’re in….you’re f*#@ed. There are two ways to win, and they are both easy. All you have to do is spread the horror. Follow @Goretorium on Twitter. Then all you have to do is mention @Goretorium in a tweet and include #Spreadthehorror in that tweet. It’s easy! Like Goretorium on Facebook. Share the flyer (by clicking here) and listen for the screams! It’s that easy! You can win two tickets to the opening night of Goretorium, and be one of the lost souls taken by the Delmont. For more information about Goretorium, including tickets, visit the official website!